The perfect cake topper for a very special birthday. Featuring a bold balloon-style logo, this ’30 Happy Birthday’ topper transforms your celebration cake into something truly eye-catching. 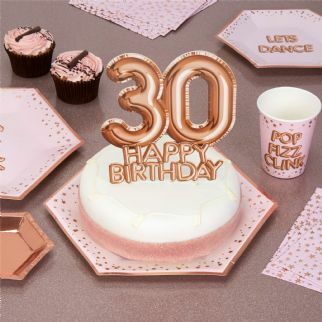 Using a pretty rose-gold colour palette, this topper adds a stylish look to your birthday cake, creating a show-stopping centrepiece for your party table.